CARLSBAD, Calif., Dec. 4, 2018 /PRNewswire/ -- According to a recent survey conducted by Jenny Craig, a leader in the weight loss industry, the holiday season poses a challenge for many when it comes to maintaining their weight, with more than half of Americans anticipating weight gain between late October and January. 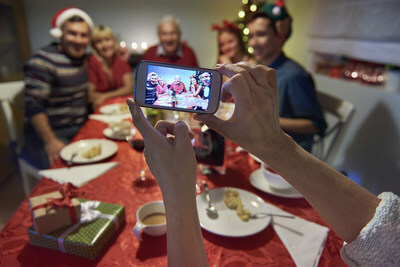 The survey, which polled more than 600 adults in the U.S., uncovered that gaining weight affects resolutions for the new year, while also finding that many avoid having their photo taken during holiday festivities due to unhappiness with their weight – and men are even more likely than women to opt out of photos. Despite anticipating holiday weight gain, Americans are optimistic about making healthier choices in the new year. More than half of Americans cite desire to improve their overall health, with one-third naming losing weight as their 2019 resolution, closely following eating healthier and exercising more. Yet, despite the desire to get healthier in the new year, more than half of women (52%) and four-in-ten men (42%) say they have no clear plan for tackling these goals. "Creating a credible and practical plan, as well as getting the right support, can help motivate and keep people on the path to their health, wellness and weight management goals," says Dr. Pamela Peeke, MD, MPH, FACP, FACSM, chair of the Jenny Craig Science Advisory Board. "In fact, according to a new study published in the Journal of the American Medical Association, those who followed structured weight loss programs with ongoing support were most successful in achieving and maintaining long-term weight loss." "There is no substitute for quality support and a realistic strategy to reach your weight loss goals," said Monty Sharma, Jenny Craig CEO and president. "The data shows that many Americans are resolving to get healthier in the new year, and Jenny Craig is proud to be a trusted partner for people seeking a healthier life. Our consultants work with each member to develop personalized plans with our premium, chef-crafted foods, set goals, and provide support and accountability, which together are a proven formula for improving health." To get started today or for more information, visit: www.jennycraig.com. The Jenny Craig program is designed to provide structure and support to help members lose weight and learn how to keep it off. Jenny Craig's program provides nutritionally-balanced menus, which include around 100 delicious entrees, desserts and snacks developed by dietitians, nutritionists, and professional chefs. One-on-one consultations provide personal support and education on portion control and strategies such as Fresh and Free Additions, which help with satiety. Jenny Craig consultants work with each member individually to identify their strengths, challenges and personal goals in order to create unique weekly meal and activity plans that fit individual needs. Consultants also help members implement behavioral strategies to support their success. Jenny Craig's comprehensive approach to weight loss is available to members either in person, in centers or by phone with Jenny Craig Anywhere. The program is backed by hard science as demonstrated by a 2010 independent two-year clinical trial published in the Journal of the American Medical Association showing that participants on the Jenny Craig Classic program lost three times more weight than dieting on their own. Jenny Craig, based in Carlsbad, California, is one of the world's largest weight loss and weight management companies, with approximately 500 company-owned and franchised locations in local neighborhoods in the United States and Canada, with approximately 600 centers worldwide.